Rachel and I have wanted to try Acqua Al 2 in Eastern Market for quite some time, so a few weeks ago we finally checked out the D.C. outpost of the legendary Florence eatery. Our friends Kelley and Ari fell in love with the original Acqua Al 2 when they were in Italy, and once they found out the restaurant would be opening in Washington they instantly became frequent diners of the establishment. Because of that, we left the ordering in their hands. 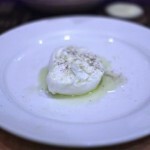 We kicked the evening off with the kitchen’s homemade burrata. 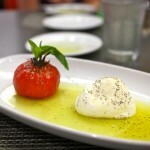 Served over heirloom tomatoes and a bed of arugula, the double-cream mozzarella was spectacular. Rich and creamy, this is a must-order dish. 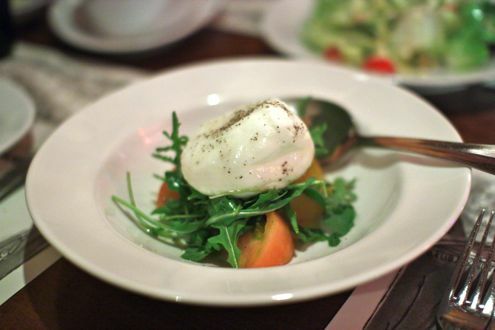 The only other burrata that was just as good as Acqua’s was the one found at Obelisk – so yeah, that’s high praise. 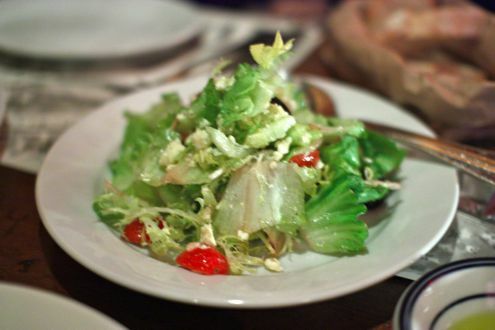 We also shared a Greek salad, which featured escarole, tomatoes, black olives, cucumber, scallions, feta, salt, pepper and olive oil. 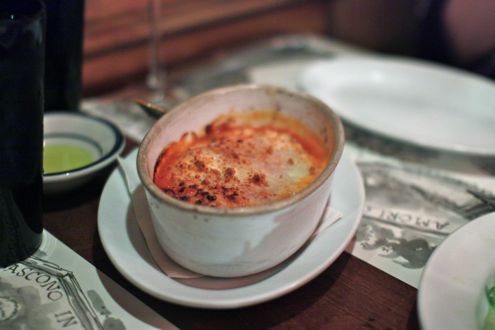 Next was the Parmigiana al Forno, which was baked eggplant with tomato sauce and Parmigiano. I really enjoyed this appetizer, but then again, I’m a big fan of all the listed ingredients. The abundant eggplant blended with the gooey cheese and homemade tomato sauce was a hit amongst the table. Following the trio of appetizers, we then moved onto the highly-recommended pasta tasting. Priced at $15 per person, the tasting includes five vegetarian pastas selected by the chef. 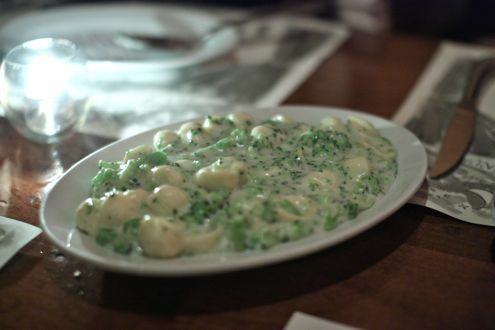 Our first tasting was Orecchiette ai Broccoli, ear-shaped pasta served in a light broccoli sauce. Rachel liked this pasta the most out of the five we sampled. 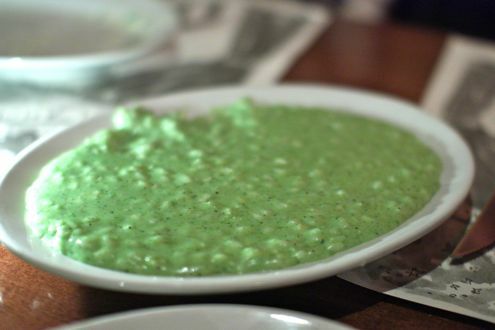 Next was Riso Sugo Verde, Arborio rice prepared with parsley, basil and rosemary. Both Rachel and I really enjoyed this dish, particularly the parsley sauce. 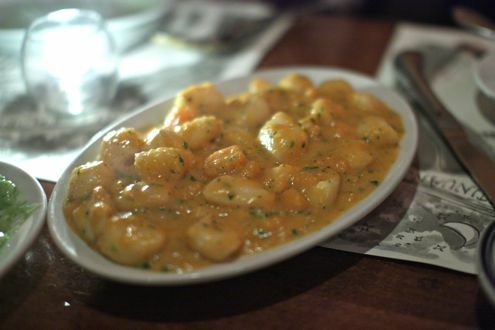 Our third plate was Topini al Zucca, gnocchi with pumpkin sauce. The gnocchi were light and fluffy while the pumpkin sauce was pleasantly not too heavy. 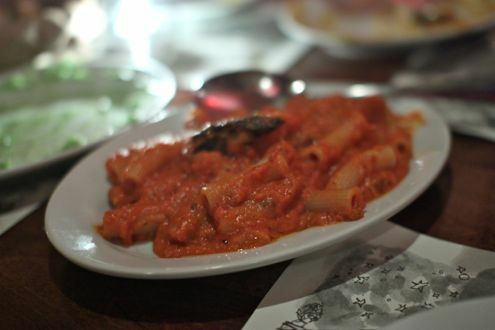 The classic penne and vodka sauce, or Maccheroni alla Vodka, was our fourth dish. And despite its simplicity, it was excellent. The best was saved for last with the Fusilli Lunghi alla Fiaccheraia. 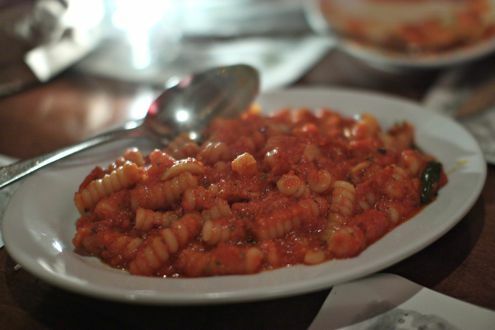 The spicy tomato sauce gave the dish some kick, while the thick and long housemade fusilli was a delight in its own right. This was my personal favorite. It was a brilliant idea to do the pasta tasting amongst the four of us not only because Kelley is a vegetarian, but also that we were able to try so many pasta dishes without feeling overly full. 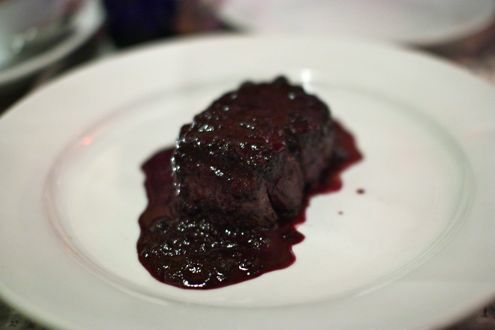 And that brings us to the secondi piatti: Ari ordered two of their hand-carved filets to share between the three of us – one topped with a balsamic reduction and the other with their famous blueberry sauce. Both toppings have their merits, but I have to admit, I was big fan of the blueberry sauce. It definitely sounds like an odd pairing on paper. I mean, steak and blueberries? But after the first bite, the blueberry flavor is subtle yet effective, and not as sweet as first perceived. It just somehow manages to work. 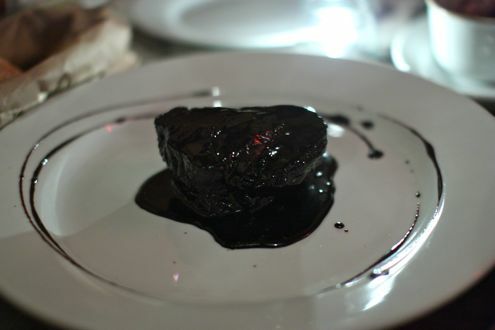 Once we finished our steaks, we ordered the Assaggio di Dolci, a sampling of four desserts. 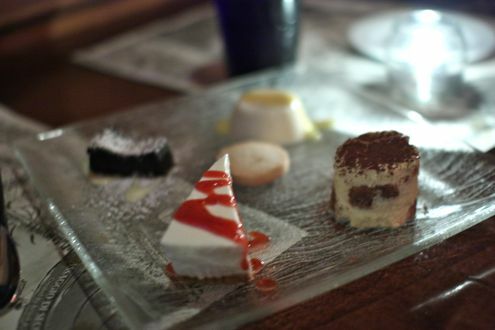 Included on the plate were panna cotta, flourless chocolate cake, tiramisu, and ricotta cheesecake. The tiramisu was my personal favorite followed by the panna cotta. Again, this was a great way to try a variety of their desserts given our party of four. 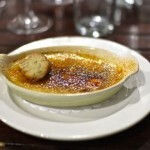 We had a lovely time at Acqua Al 2 and were very impressed not only by the food but also the first-rate service. 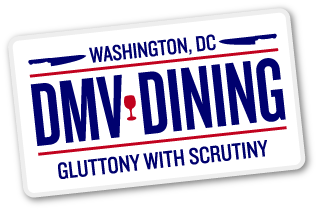 Being a former waiter, I notice the little things like clearing plates and refilling waters, and the staff at Acqua was very consistent about things like this. Rachel and I would return here in a heartbeat, especially since it’s so easy to park around Eastern Market. All I can tell you is that the pasta tasting will be ordered on each and every visit. Enjoyed your review. I’ve been meaning to get here for a long, long time and haven’t made it. You have motivated me!